With New Inquiry, Harry Reid Raises Stakes In Senate-CIA Clash : It's All Politics The majority leader informed the CIA director that the Senate's chief law enforcement officer would be conducting a "forensic examination" to get answers in the unprecedented dispute. Senate Majority Leader Harry Reid faces reporters on Capitol Hill in Washington on March 11, following a caucus lunch. When Senate Majority Leader Harry Reid declared "I support Senator Feinstein unequivocally" the same day she thrashed the CIA on the Senate floor, the question of whether the pugilistic top congressional Democrat from Nevada would leap into that fight seemed less a matter of if than when. A little more than a week later, Reid made his move. He fired off a letter to CIA Director John Brennan informing the top spy that Senate Sergeant at Arms Terrance Gainer would be performing a "forensic examination" of computers and a computer network meant for exclusive use by the Senate Intelligence Committee. Feinstein, who chairs that panel, had accused the CIA of clandestinely removing hundreds of pages of documents from those computers and searching the computer network without her consent. The documents in question were part of a trove of more then six million pages the agency provided for an investigation, started in 2009, by the committee into CIA interrogation and detention practices during the George W. Bush administration. Feinstein has asked the Justice Department to look into the CIA's removal of documents and its searches of the committee's computers. The CIA's acting general counsel apparently believes Feinstein's committee staff may have obtained the Panetta review documents unlawfully and has filed a criminal report with the Justice Department. In his letter to Brennan, Reid calls the suggestion that Intelligence Committee staffers hacked into the CIA's computer networks to get those documents "patently absurd." But the Senate's top Democrat cannot count on the Justice Department to make the CIA's accusations go away. At a news conference on the same day Reid alerted Brennan of the sergeant at arms probe, Attorney General Eric Holder was decidedly non-committal when asked about opening investigations into either the CIA's or the Intelligence panel's complaints. "We get referrals all the time," he said, adding that the DOJ would review the referrals in question and decide what action, if any, it would take. 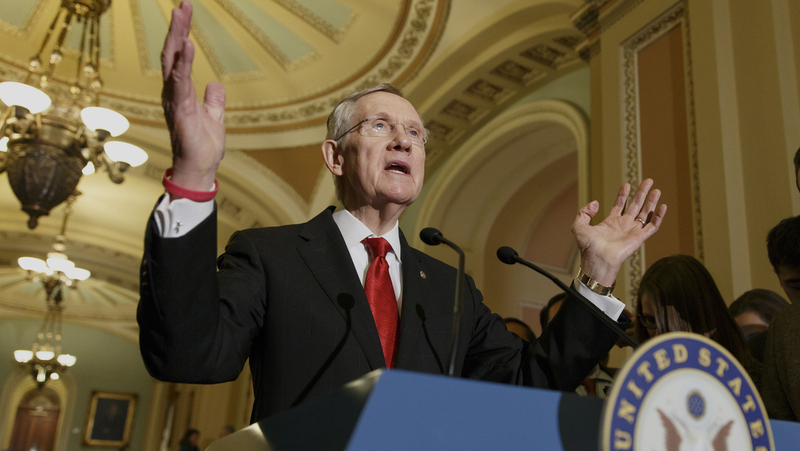 Reid's initiative may take some of the heat off Holder to begin a formal probe. It might also be reason for skeptical Republicans on the Intelligence panel — who prefer to keep the 6,300 page report written by committee Democrats under wraps — to hold their fire while the sergeant at arms looks for any evidence of mischief by committee staffers. But two problems loom. One is that Sergeant at Arms Terrance Gainer serves at the pleasure of the Senate's Democratic majority — making any probe he may carry out prone to charges of bias. The other issue is Gainer himself. Just hours after Reid's notification of the probe to Brennan came to light, the majority leader's office made another announcement: Gainer would be departing his post "this spring". According to Reid's spokesman, Gainer's departure had been in the works for some time and has nothing to do with a probe assigned to his office that could potentially pit the sergeant at arms against the CIA. That task will likely fall to Deputy Sergeant at Arms Drew Willison, Gainer's designated successor. "These developments strike at the heart of the constitutional separation of powers between the legislative and executive branches. Left unchallenged, they call into question Congress' ability to carry out its core constitutional duties and risk the possibility of an unaccountable Intelligence Community run amok."